If the hurt feelings brought to light yesterday are still present, they may color the early part of the day. That’s because the Moon is in tense alignment with Venus and Mars, the planets help shape the way we navigate relationships. 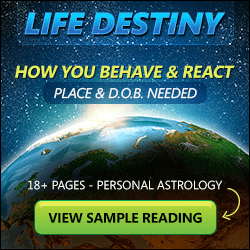 With messenger Mercury in harmony with powerful Pluto, you’ll find additional ways to communicate what you are feeling. An honest and engaging dialogue turns out to be incredibly transformative. With the Moon moving into sensual Taurus, you can find additional peace and solace in pleasurable activities. Consider gardening getting a massage or enjoying a delicious meal. The Sun is at 12 degrees Virgo, the Moon is in Taurus, Mercury is in Virgo, Venus is in Cancer and Mars is in Scorpio. With this combination of planetary energies try to: Buy a warm comfy blanket that you can leave on the couch. Try not to: Check up on your honey every few hours. It’s called stalking. Moon Opposite Saturn: Feeling Pessimistic. Mercury Trine Pluto: A Way with Words. Moon Sextile Neptune: Subtle and Sweet. And finally happy birthday to Beyonce Knowles, Damon Wayans and Mark Ronson.